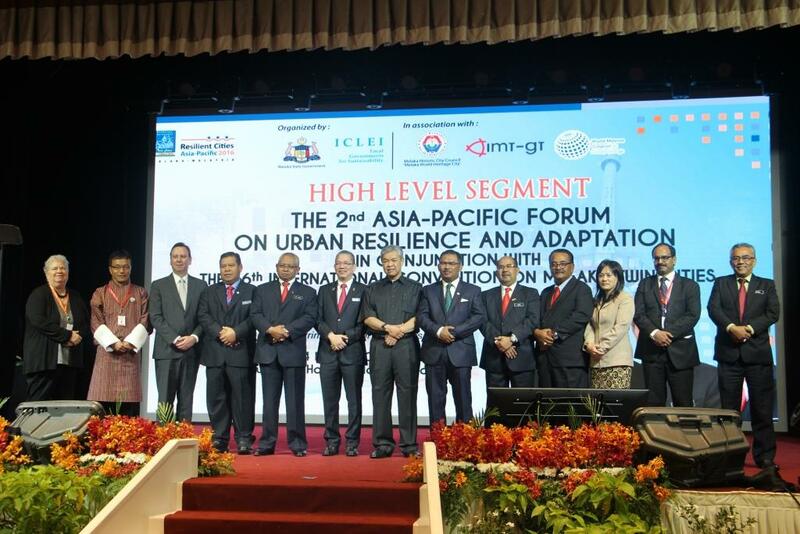 After two days of deliberations that reaffirmed the importance of building resilience in cities and promoting initiatives from city mayors and councilors, the Resilient Cities Asia-Pacific 2016 congress closed on 4 March. The Congress, held in conjunction with the 16th International Convention on Melaka Twin Cities, was officially opened by YB Datuk Abdul Rahman bin Dahlan, Minister of Urban Wellbeing, Housing and Local Government, Malaysia, on 2 March and attended by YAB Datuk Seri Ir. Hj. Idris bin Hj. Haron, Chief Minister of Melaka. At the high level segment on the closing day, YAB Datuk Seri Utama Dr. Ahmad Zahid bin Hamidi, Deputy Prime Minister of Malaysia, said, “Cities must be inclusive and offer adequate opportunities for low-income households to improve their livelihoods.” This, he said, would ensure that inequality and poverty, which are the two issues often associated with urbanisation, were effectively managed. The Deputy Prime Minister insisted that the effort to build resilient cities must start from the people. “The country believes that development and conservation should go hand in hand so that efforts towards one do not hamper the other,” added the Deputy Prime Minister. Following the global trend where cities are being seen as epicentres of change, he acknowledged that it is more relevant than ever to promote them. The Deputy Prime Minister also applauded Melaka for having its first GHG emissions inventory, created in partnership with ICLEI. Gino Van Begin, Secretary General of ICLEI, thanked Melaka for hosting the 2016 Congress. “I am confident that the proceedings of the Congress will set the tone for new development agenda that will be adopted at Habitat III this year,” he said. Van Begin also expressed his hope that the messages from the meeting would resonate for years to come. The Chief Minister of Melaka reiterated the message that emerged from many sessions: this is an opportune time to take the global agreements that were signed in 2015 forward and use them as tools for further development.